Local Buffalo SEO gets you more business than your competition. You'll simply show up higher when people look for you online! Local SEO in Buffalo, New York -- or any other city, is often misunderstood. There is no magic formula. Anyone who promises you the first position has no idea what they are doing (or isn't being entirely honest with you.) Unfortunately, because of the huge need for local SEO and the limited number of digital marketing companies that actually know what they are doing, there's a whole lot of "me too" companies ready to sell you useless services that just won't produce real world results or a worthwhile return on your investment. We provide real local SEO services that drives useful traffic - leads and potential customers - to your website. We implement tested and proven industry best practices on your behalf. Great content, properly tagged pages and images, good site layout and web design, site speed and mobile compatibility, the overall user experience -- these are just some of the factors that contribute to improving your ranking. It's a wholistic approach that requires individual attention to your business from experienced experts. Local SEO in WNY includes 2 different placements. 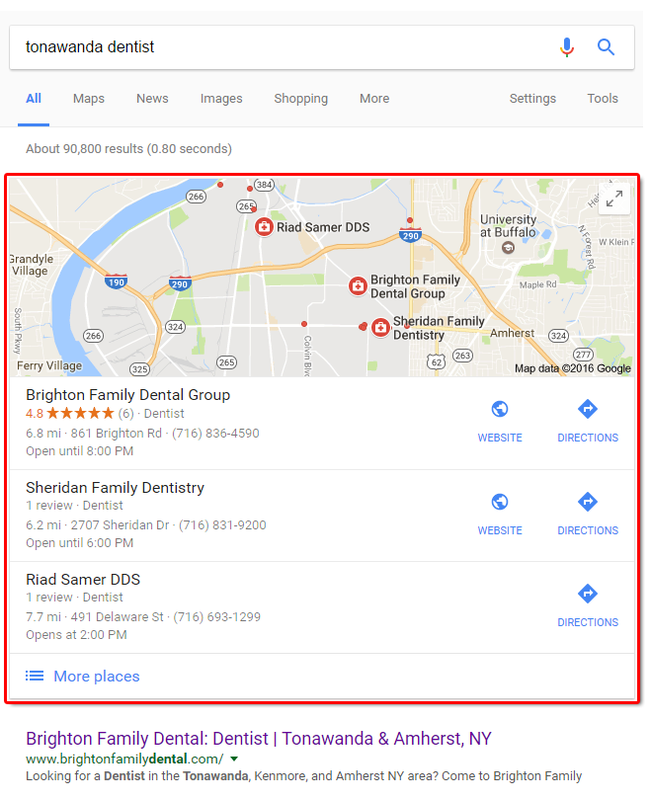 The first place your customers may find you online is actually on a local map, placed atop the page of search results. These exist on Google, Bing, and Yahoo, although Google gets the lion's share of local traffic. These results are displayed prominently and include a quick summary of all the information a customer needs - your location, phone number, hours of operation, and more. If your website isn't designed properly, and/or if you haven't configured your business properly with the major search engines, you may have an incomplete listing, or no listing at all! Missing out on this prime local placement is lost business, period. The second type of placement is called an "organic listing" below the maps - these are your typical search results you are likely familiar with. Your organic listing is still another important piece of the SEO puzzle. It's another opportunity for a potential customer to find your website. There are a number of techniques we can use, and specifically calculated improvements we can make to your website to help you rise up in the organic listings. How do you select a reputable Buffalo based SEO provider? One thing we would not recommend is doing business with someone from out of town calling you offering their SEO services! Unfortunately there are too many of these companies and their business model does not require happy retention. They will be glad to sell you a long term, perhaps annual contract and take your money up front. When your contract is up and you realize promises haven't been kept and results weren't delivered, they'll just move on to the next business that doesn't know any better. Please don't fall into that trap. At times, these companies give SEO a bad name in the industry. When done properly, it's an amazing and powerful tool that really will help your bottom line. Future Buffalo Website Design is a local Buffalo, NY company that has a proven track record of providing local SEO for WNY businesses. We're locally based and locally focused - who better to help you with local search? We won't require you to sign a long contract backed by empty promises. Instead, you pay us for performance and we'll let the results we actually deliver do the talking. Because we do things the right way, we're confident you'll want to keep us as a long term partner in growing your business. We are a member of the BBB, in good standing, and can provide real business references if you would like to move forward. Even better, give us a call at (716) 221-0701 or request a free 15 minute consultation to learn about how we can help! Future Buffalo Website Design © 2019. All rights reserved.